On April 21st 1936, 22-year old Ellison Brown arrived at the Rhode Island State House and was met by a roaring ovation from the Rhode Island General Assembly. 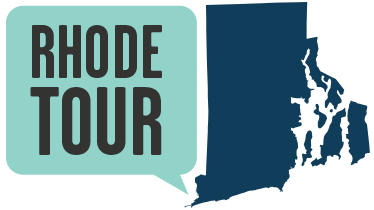 When asked to speak, he said "I did it for Rhode Island." What Ellison had done was win the Boston Marathon. Very few people had heard of Ellison the day before, but now he was the talk of the world. Newspapers far and wide were swept up by Tarzan's story, which often focused on his Indian heritage. Headlines aimed to sell papers, read "Hailed as 'First 100 Percent American' to Win Boston Marathon." Born in 1913, Ellison Brown was the fifth of eight children to Otis Brown and Grace Ethel Babcock. As a child, Ellison earned the nickname "Tarzan" for his love of climbing and swinging from trees. His traditional Narragansett name was "Deerfoot." At 12, Ellison left school to help provide for his family, working as a manual laborer at Woods River Junction railroad. Following in the Narragansett tradition, Ellison's father taught him stonemasonry. At 16, Brown started formal marathon training with Tippy Salimeno as his trainer. He ran his first Boston Marathon in 1933. In 1935, Brown ran with the support of his tribal community, finishing in 13th place only two days after his mother's passing. One of his mother's last wishes was that he run the race. Ellison showed up wearing an outfit made out of one of her dresses and finished the last 6 miles barefoot, after complaining about his shoes. Brown was often a showman-sometimes racing ahead so he had time to rest or eat. Brown took first place in both the 1936 and 1939 Boston Marathons. Heartbreak Hill got its name in the 1936 race, when Johnny Kelley reportedly hit Ellison on the backside, which spurred him to victory, breaking Kelley's heart. After this win, Tarzan headed to Berlin with the U.S. Olympic team. He could not finish the race due to an injury and unfortunate disqualification. Although making the 1940 Olympic team, the games were cancelled due to WWII. Brown was the first runner to break the 2-hour-30-minute mark for the marathon. 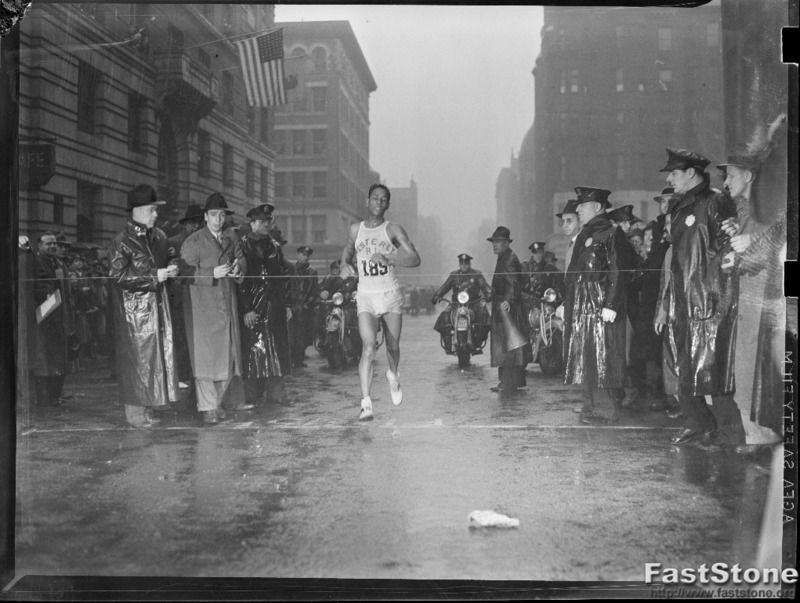 In 1936, Brown won back to back marathons: the first in New York, followed by a race in New Hampshire, to which he hitchhiked overnight. These races took a toll and Brown suffered a double hernia later that week. Ellison often pushed himself beyond the breaking point because his winnings helped provide for his family. In 1973, Tarzan was inducted into the National Indian Athletic Hall of Fame in Lawrence, Kansas. The following year, a dinner was hosted in his honor in Rhode Island. Hundreds came to celebrate, including many people from his marathon days. Even Johnny Kelley didn't miss the event! Tragically, Brown was murdered in Westerly in August of 1975. He was struck by a vehicle while outside a bar in Misquamicut. Charges were filed against the driver, a young Connecticut man who had argued with Brown in the parking lot. Although gone, Brown will never be forgotten. 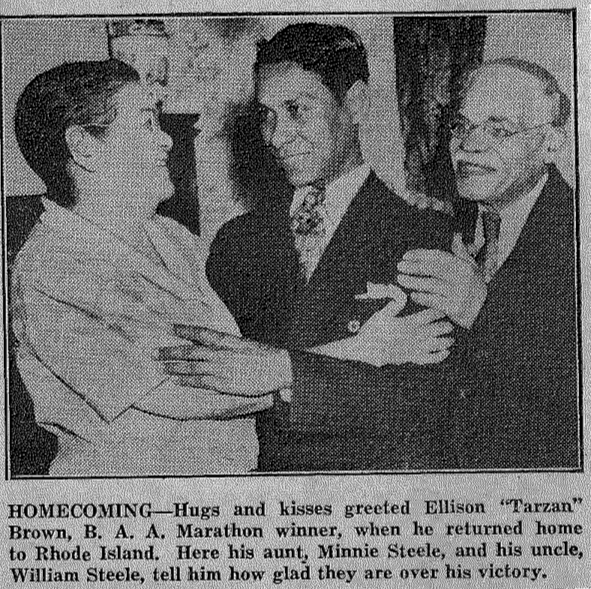 Brown Being Honored in Rhode Island: Ellison Brown was welcomed home with open arms by his Rhode Island family after winning the Boston Marathon. Brown Winning the Boston Marathon: Here Ellison Brown is crossing the finish line to win the Boston Marathon; he was the first person to break the two-and-a-half-hour mark. Brown Running in the B.A.A. 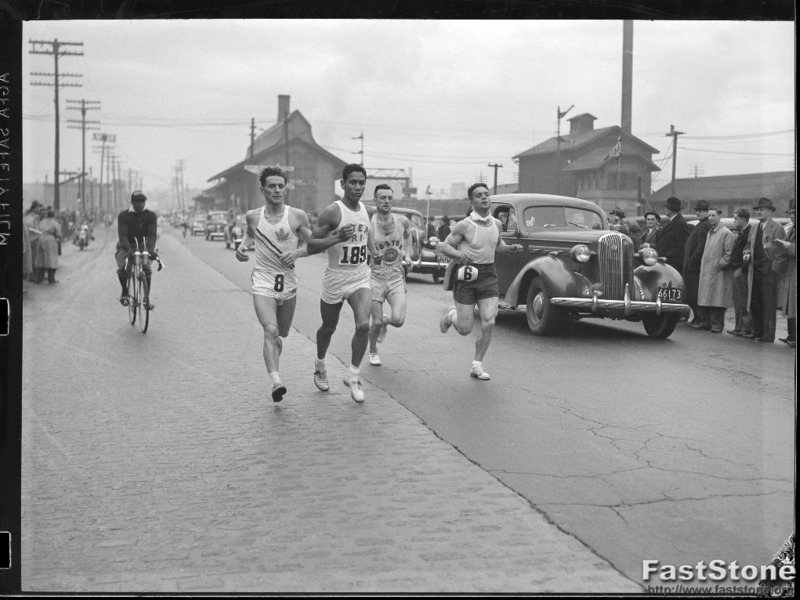 Marathon: Here Brown can be seen passing his opponents in the 1939 marathon. He went on to win this race, three years after winning his first (1936). 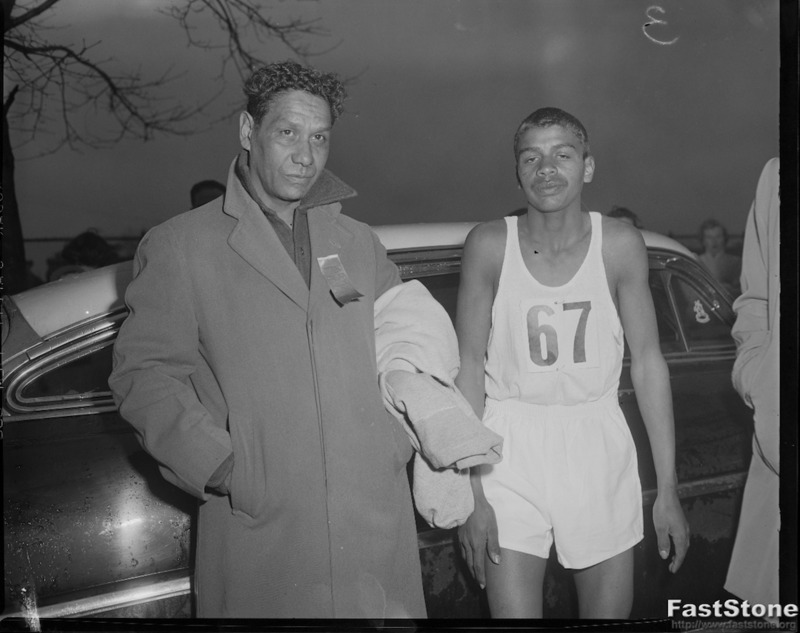 Tarzan Brown with His Son: Brown with his son at the Hyde Shoe 12-Mile Race in Cambridge, MA (1955). Ellison is considered a hero to the Narragansett for making the Narragansett people visible around the world during a century of great invisibility--from the 1880s and detribalization to Federal Recognition in 1983. The Tarzan Brown Mystic River Run in Connecticut began in Brown's honor and has been held annually since his untimely death. There is currently an exhibit on display about Tarzan Brown at the Tomaquag Museum, which includes one of his trophies. There is a strong tradition of running in Native American communities. Harvard paleoanthropologist Daniel Lieberman and Chris Sockalexis of the Penobscot Nation discuss endurance running across Indian Country. Katharine Kirakosian and Tomaquag Museum, “Ellison Myers "Tarzan" Brown,” Rhode Tour, accessed April 21, 2019, http://rhodetour.org/items/show/300. Ward, Michael (2006) Ellison "Tarzan" Brown: The Narragansett Indian who Twice Won the Boston Marathon. McFarland & Company, Inc. Publishers.Dowdell, Grace. Tomaquag Booklet, Ellison “Tarzan” Brown, Indian Marathon Runner.